Positron’s next generation AK626LC point-to-multipoint FlexStream line card enables the transport of high-quality, ultrahigh-bandwidth Ethernet business services and Mobile backhaul services over bonded copper pairs. The FlexStream AK626LC point to multipoint line card is a standard compliant VDSL2/ ADSL2+ multimode system with vectoring. The AK626LC line card is capable of delivering up to 1 Gbps of aggregate bandwidth over bonded copper pairs. 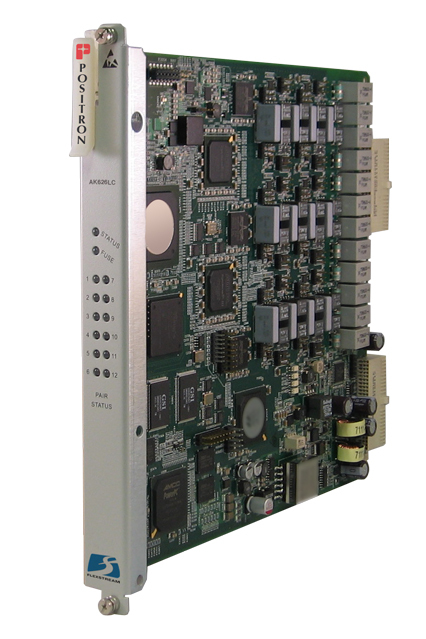 The AK626 line card can be deployed in conjunction with the industry leading Positron Access Solutions AK500 series 8/4 pair Carrier Ethernet bonded copper products. On the opposite end, the AK626LC connects to an eight pair AK624 remote unit or to a four pair AK622 remote unit. Vectoring capability enables the service providers to increase the bit rate at the same reach. The AK626LC is designed to dynamically compensate for individual copper pair failures. If a copper pair fails, the AK626LC automatically adjusts the other copper pair Signal-to-Noise Ratio (SNR) margins to compensate for the loss. This unique resiliency feature allows any pair to protect all the pairs in a bonded group. Traditionally, Ethernet services were only available to customers served by fiber. However, with the AK626LC, service providers can now provide scalable Ethernet bandwidth up to 800 Mbps to small medium enterprises/businesses. Wireless carriers and service providers can now extend and expand the growing Mobile backhaul bandwidth at a fraction of the fiber deployment cost and future proof their backhaul network with bandwidth up to 800 Mbps. The AK626LC offers high density ultrahigh bandwidth capable of supporting a combination of two/four/eight pair bonded group in a single line card (with vectoring and G.INP impulse noise protection). The AK626LC flexible bonded group and point-tomultipoint capability lowers the total cost of ownership (TCO) and enables faster return on investment (ROI) to carriers. The unique multimode capability allows the carriers to deploy ultrahigh bandwidth at short distances or extend the rate/reach beyond CSA limits. The AK626LC can be configured for all VDSL2 proarchive up to 17a and will automatically switch to ADLS2+ on longer loops and then ADSL2 and ADSL. The AK626LC system is a standards-based multimode product that provides superior performance and reliability. The AK626LC capabilities also include features that improve the stability and performance of the copper loop, such as VDSL2 virtual noise, artificial noise generation, seamless rate adaptation and impulse noise monitoring. The AK626LC vectoring noise cancellation technique significantly enhances the bandwidth when compared to the standard VDSL2 bonded copper solutions. The AK626LC system can be securely managed by Positron`s Element Management Software (AKEMS) and AktinoView (GUI software) or via a Command Line Interface (CLI). The AK626LC interoperates with industry standard Network Management Systems providing comprehensive performance monitoring for both Ethernet and physical layers.